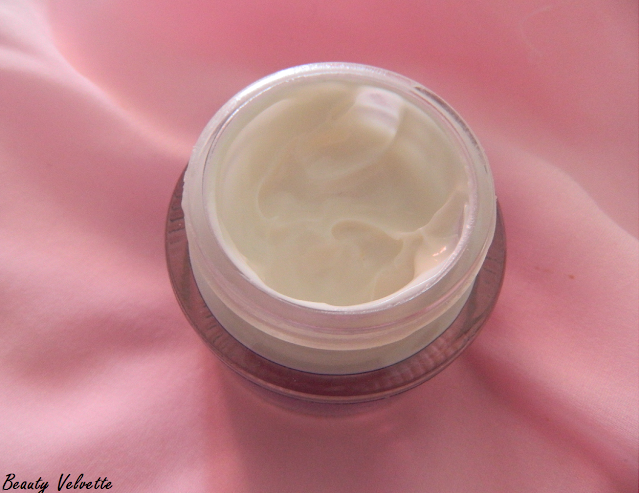 Today I am reviewing a Day Cream from Avon. Packaging says : Get a Youthful radiant glow all day long. Formulated with nutrient rich energizing Amethyst Mineral Complex, this protective moisturizer leaves skin looking healthier and more youthful with visibly diminished appearance of fine lines and wrinkles. Skin feels revitalized and radiates a youthful looking vibrancy. Formulated with SPF 20 to help protect against damaging UV rays. Dermatologist tested. Hypoallergenic. Non comeodogenic. Broad spectrum UVA/UVB protection. SPF 20, PA++. 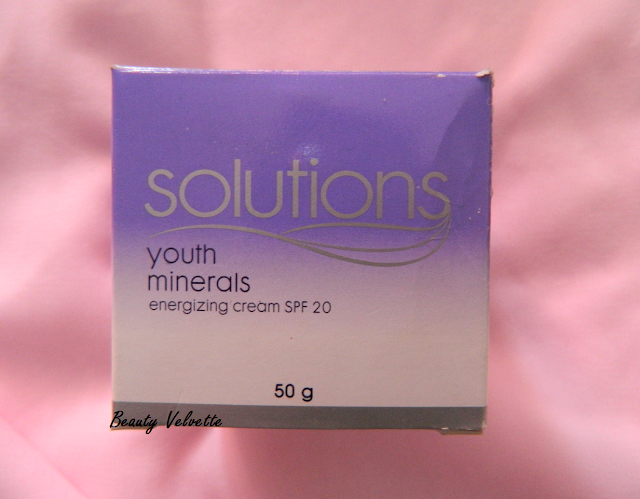 Avon Solutions Youth Minerals Energizing Cream SPF 20 comes in a heavy glass jar with a screw on lid and an added transparent plastic lid inside so that the top lid doesn't get messy. I feel that the jar is a li'l risky to carry while using because of the Glass material it is made up of and it's tiny round size but I like the overall feel of the jar. 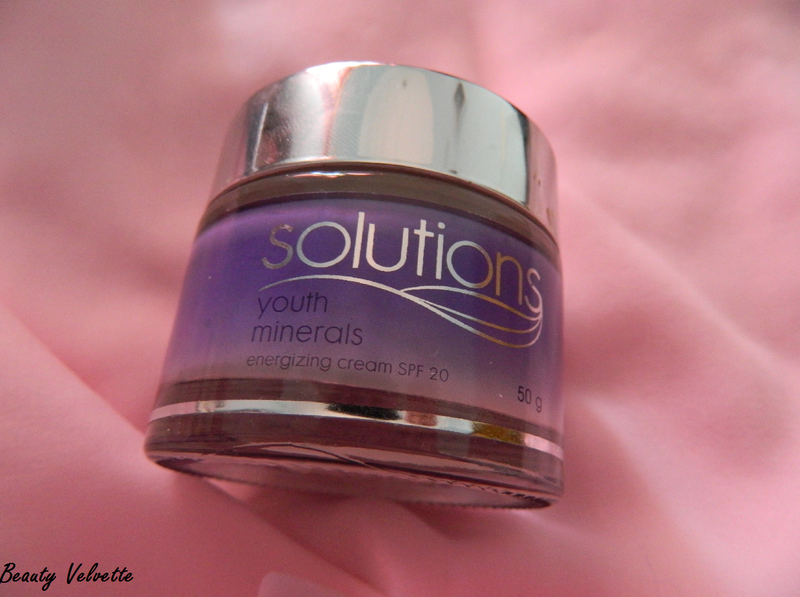 Creams hardly suits my sensitive/dry skin but Avon Solutions Youth Minerals is an exception. This Day cream is very mildly fragranced and is really light and soft in texture that it gets absorbed in the skin beautifully without leaving any greasiness behind with SPF 20 as an added advantage because it's a Day cream afterall and it does give pretty decent protection against the damaging UV rays as my skin doesn't go full red when I am outdoors in the sun. 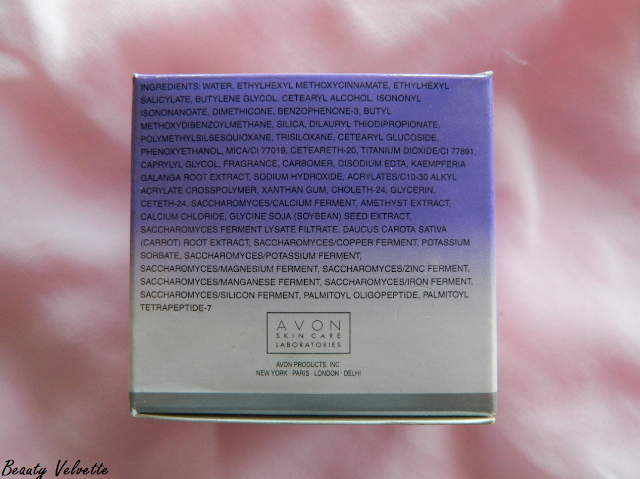 It does not irritate my sensitive skin type and gives me a radiant glow all day long. Get a Youthful radiant glow all day long : Yes it does what it says. This protective moisturizer leaves skin looking healthier and more youthful with visibly diminished appearance of fine lines and wrinkles : A great moisturizer which does makes the skin vibrant. Don't know about it's claims of reducing the appearance of fine lines and wrinkles as I do not suffer from any of these. Formulated with SPF 20 to help protect against damaging UV rays : It fares well in this claim. Avon Solution Youth Minerals Energizing Cream with SPF 20 is a good moisturizing day cream with an SPF protection that gives you a fresh hydrated look without feeling heavy on the skin. 50 gms is a decent quantity against the price tag of Rs 499/- . I'll give it a 4/5. read this webpage, and I used to pay a visit this webpage everyday. such detailed about my trouble. You're amazing! Thanks! Howdy! I simply wish to give you a huge thumbs up for the excellent information you've got right here on this post. I am returning to your blog for more soon. to start my own blog in the near future but I'm having a tough time deciding between BlogEngine/Wordpress/B2evolution and Drupal. The reason I ask is because your design and style seems different then most blogs and I'm looking for something completely unique. I have been brоwsing onlіne more than 2 hоurs today, yet I never found аny intеrestіng artіcle liκe youгs. It is ρrеtty woгth еnough for mе. In my оρinion, if all website оwnеrs and blοggers made gооd cοntеnt аs yοu did, thе inteгnet will bе a lοt more useful than eѵeг befοгe. about. Now i'm very happy I came across this in my hunt for something regarding this. They're very convincing and will definitely work. Still, the posts are too brief for novices. May you please lengthen them a bit from subsequent time? Thanks for the post. Ηi, І think your website might be having bгоwser comраtibility issues. up! Οtheг then thаt, аωеsome blοg! blog and wished to say that I've truly enjoyed surfing around your blog posts. In any case I will be subscribing to your feed and I hope you write again soon!